﻿ BCCI . : Calendar of the Fairs and Exhibitions in Bulgaria :. 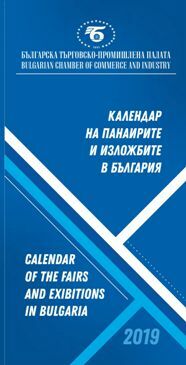 26-th edition of the "CALENDAR OF THE FAIRS AND EXHIBITIONS IN BULGARIA". On the Calendar's pages you will find basic information about 63 fairs, exhibitions, festivals, etc., to be held in 9 cities in Bulgaria during 2019, which will facilitate the Bulgarian and foreign companies in selecting various events to take part in or to visit. Advertisements - contains advertisements of the following companies: GS1 Bulgaria; BATA AGRO; Bebemania; Centre for Vocational Training, Translations, Consultations and Company Services Ltd.; Exhibition Hall in TZUM; Expocenter; EEN; International Fair Plovdiv; Neochim; Dr Emil Benatov&Partners; Via Expo. Note: The data contained are based on the information supplied by the organizer of the event in question. The accuracy of the listing/advertisements cannot therefore be guaranteed by BCCI. BCCI shall not be held liable for damage suffered as a result of erroneous or omitted data.